The Manage stage begins when all initial compliance requirements have been met and all scientific/programmatic preparations have been made. It comprises the entire time the research project is being conducted and includes all scientific activities as well as the supporting administration. It ends when data have been collected and analyzed and the project period has ended. In some cases, scientific/programmatic and administrative activities may progress from the Manage stage to the next stage (Closeout) at different times. The Principal Investigator (PI) is responsible for all scientific/programmatic and compliance aspects of the project, including fiscal management. School and college administrators provide advice and support on administrative matters to the research team. Central unit administrators provide guidance and support for specific administrative and compliance matters. A detailed project plan for the science should be developed and followed. It should be used by the research team and consulted by administrators in Schools and Colleges to assure the project progresses satisfactorily. Develop a plan for managing the financial, human resource and operational aspects. Implement internal controls to create a compliant environment. 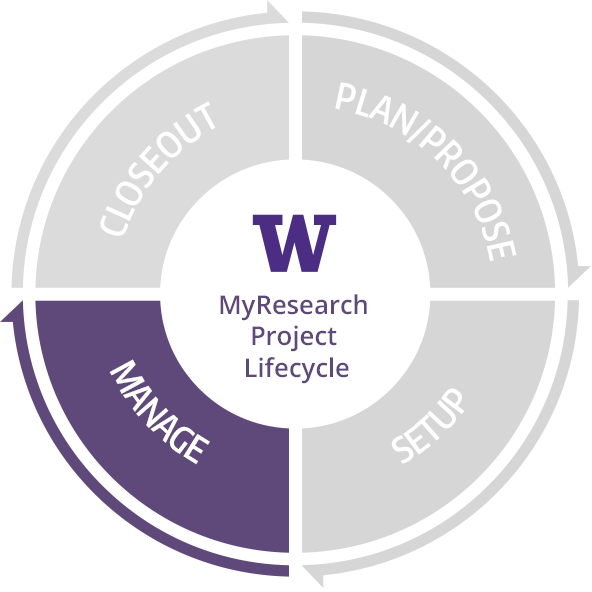 Monitor scientific progress throughout the project and make changes in direction as appropriate, with sponsor approval when required. Verify compliance requirements (spending, reporting, disclosures, etc.) are met throughout each stage of the project. Report progress as required by the sponsor. Report problems or non-compliance to University officials. Know and understand what occurs in your Final Action Date.